Reason for Sale: Need cash. Accessories Included: Original box, manual. Payment Options: Cash, Bank transfer,. Last edited by lvlyvis; 29-11-18 at 12:22 PM. Was it used for mining? The bill says you bought six. I have his phone number if you dont. He approached me a few weeks to sell this as well. he has a few reviews so it should be okay but something is sketchy for sure. Only thing I'd be cocnerned about it is if it was used for mining extensively. He bought 6 cards according to the invoice. Payment ricieved will ship soon. 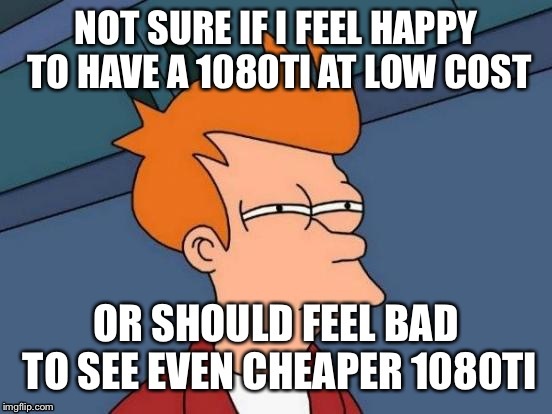 I just received the 1080 G1 he shipped for me. He made no mention of a bill and is still trying to arrange it for me. Give him time and in general, can everyone STOP ATTACKING SELLERS on erodov, please? Thanks dear here non-buyer's having more query and Intereast then buyer's. Its not about attacking sellers. Its about being vigilant. Plenty of times people have been scammed here. Its a community that is trying to look for each other. I just saw two identical threads with exact same bills under different usernames. Whats the harm in pointing it out? if the seller is genuine then there is absolutely no issue but if he isnt it saves someone a lot of headache. ANeoRki, mehtaarjun, ayogi and 1 others like this. Different usernames? I didn't pay attention to that detail. Alas, what is the world coming to. If I post threads, if people don't object, mods do. I took this to be another 'hey gotcha' moment where another seller had his back against the wall. Legit guy. But yes, it'd be nice if you could elaborate on the bill details. Not that I (really) want to know, but it's a public forum, we've all got a part to play in keeping it safe. I think the next logical step will be to have the mods collect personal information (docs) prior to marketplace postings. Any thoughts, people? Look at the bill in this thread here Graphics Card For Sale Nvidia GTX 1080TI 11GB GDDR5X Its Nvidia Own Sub Brand Inno 3d by another user with no feedback. Same card and photocopy of teh bill above. Could it be on of the 6 cards? Sure but we dont know. I didn't post with different username if anyone post after buying from me i can't do anything. If you dont want people sifting through your thread publicly available on a forum, maybe dealing here doesnt suit you. mehtaarjun, ayogi, kal360 and 1 others like this.